STORMINSPANK'S HAWKEYE RAMBLINGS: FOOTBALL: Did you know Bobby Bell is the "Greatest Defensive Player of All-Time"? FOOTBALL: Did you know Bobby Bell is the "Greatest Defensive Player of All-Time"? Well, according to Tim Brewster he is. OK, Bell was good (strike that - GREAT), but to say the best defensive player of all-time? Really? Put down the juice, Brew. 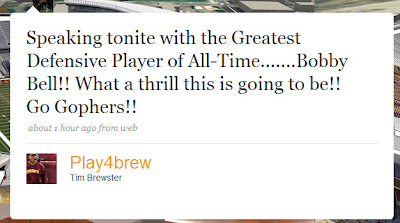 Even if Brewster meant "Greatest [Minnesota Golden Gopher] Defensive Player of All-Time", I still would call him on it. Hell, I'd put Bronko Nagurski ahead of Bell. Sure, he made his living on offense, but he was a beast on defense, as well.